The healthcare setting is predisposed to harbor potential pathogens, which in turn can pose a great risk to patients. Routine cleaning of the patient environment is critical to reduce the risk of hospital-acquired infections (HAIs) . It has been estimated that 30–40% of HAIs are caused by the contamination of healthcare worker hands. Hands are contaminated either from contact with infected or colonized patients, or with their environment . Many studies quoted by CDC Guideline for Disinfection and Sterilization in Healthcare Facilities suggested that , Noncritical environmental surfaces frequently touched by hand (e.g., bedside tables, bed rails) potentially could contribute to secondary transmission by contaminating hands of health-care workers or by contacting medical equipment that subsequently contacts patients. Selection of disinfection materials and the method of disinfection should be given very careful attention. Ayliffe et al. compared the soap and water with disinfectant during surface cleaning and noted that bacterial contamination in soap and water without a disinfectant increased from 10 CFU/mL to 34,000 CFU/mL after cleaning a ward, whereas contamination in a disinfectant solution did not change (20 CFU/mL). Studies also have shown that, in situations where the cleaning procedure failed to eliminate contamination from the surface and the cloth is used to wipe another surface, the contamination is transferred to that surface and the hands of the person holding the cloth [5,6]. Even though disinfectants generally reduce bacterial colony counts further than detergents, efficacy is dependent on many factors including concentration, contact time with surfaces, types of bacteria or viruses, and care of mops or cloths . mop heads, but chemical disinfection with a phenolic products was less effective. Frequent laundering of mops (e.g., daily), therefore, is recommended. Single-use disposable towels impregnated with a disinfectant also can be used for low-level disinfection when spot-cleaning of noncritical surfaces is needed . There are some studies on the kind of mop to be used for disinfecting the surfaces. Wren et al. showed that ultra microfibre cloths consistently outperformed conventional cloths in their decontamination ability, across all surfaces. However they suggested further studies to define accurately how these cloths, which are designed to be used without detergent or biocides, might be capable of safe and effective deployment and recycling in the healthcare environment. Rutala et al. found that the microfiber system demonstrated superior microbial removal compared with cotton string mops when used with a detergent cleaner. The use of a disinfectant did not improve the microbial elimination demonstrated by the microfiber system. Doll et al. has mentioned in special comments that while many approaches to environmental cleaning exist, manual cleaning supplemented with ongoing assessment and feedback may be the most feasible for healthcare facilities with limited resources. Although there are number of studies which may give us guidance on the type of disinfectant to be chosen for the various surfaces (EPA registered hard surface disinfection chart by NH department of education)  and regarding the best quality of mop suitable for surface disinfection, very less literature has been noted so far contributing towards the method or exact procedure of disinfection in practical setting keeping in mind the infection control perspective. Patient surrounding might work as a source of infection to patient as well as health care workers (HCWs). It is therefore very important to disinfect the surroundings regularly using proper technique. Mostly the disinfection procedure varies from hospital to hospital, but there are few points that need to be taken care of by the hospital policy makers. First, all unit heads should make their own list of high, intermediate, and low risk areas in the unit. The high risk areas are high touch areas, e.g., bed railing, tap handle, refrigerator handle, hot plate switch, monitor knobs, bed knobs, foot end trolley surface, infusion pump knobs, ventilator knobs etc. These areas should be disinfected every two hours. Intermediate risk areas like nursing counter, shelves, and doors can be disinfected after every six to eight hours. However the low risk areas like store, cupboards can be disinfected once a day. Second, all hospitals have their own funds distribution. There are some hospitals where disinfectant wipes are being used for disinfection. These wipes are single time use and can be thrown afterwards which decreases a lot of work on part of hospital attendants or health care workers. However in some less affording hospitals still the mop and basin method is being used. It is very important that the mode of disinfection and quality of articles should be clearly communicated to all the health care workers and the availability of articles required for disinfection should be monitored and ensured. Third, the unit should have regular classes of hospital attendants and health care workers on the technique of disinfection. The hospital attendants should be trained about the high, moderate and low risk areas in the unit. During terminal cleaning, when they have low, intermediate as well as high risk areas for disinfection in one go, they should start from low risk areas and then go towards moderate to high risk areas. Using this sequence they may ensure better disinfection. And fourth, the whole disinfection procedure should be supervised by the trained supervisor and there should be a housekeeping record of all the disinfection procedures being done in the unit. Use of readymade disposable disinfectant wipes as mentioned earlier is always an easy and less time consuming approach to do disinfection. However in hospitals where the disinfection work is many times handed over to the hospital attendants who are not oriented to the infection control practices, there is increased risk of malpractices. They may be found taking the disinfectant wipes out from the box and do multiple random strokes on one bed to another bed or surrounding. So, it is very important to educate and train them before handing over the task to them. The wipe should be used using single stroke method, and while doing disinfection of one bed and surrounding, they should be taught to start from low risk area toward high risk area. They should also be educated regarding the proper way to take the wipe out from the box such that the box mouth surface should not get touched with the spoiled hand, and also attention need to be paid on hand hygiene between two patients. As the traditional basin and mop method is still being used in many hospitals with resource constraint, attendants if not trained properly may adapt their own shortcuts to do the disinfection e.g., pouring the disinfectant directly on bed and then use of unclean mop or handful of cotton to make random multiple strokes on the bed and surroundings and leaving some surface areas during the practice. So, there is a need of proper protocol related to that. In the present article an effort has been taken to make a step wise approach for doing the chemical disinfection using triple basin method. As already mentioned the choice of disinfectant and mops depends on many factors, it is always a wise approach to follow the respective hospital policies. But, before going forward to the steps of disinfection procedure, it’s always a good approach to know about the common errors which may lead to the faulty practice. 1. Not making the proper strength of disinfectant: The microorganism can be killed only when they come in contact with minimum concentration of disinfectant for a particular contact period specific to that disinfectant. Excess concentration may lead to allergic reactions to the person coming in contact with disinfectant and low concentration may be not effective enough to destroy microorganisms. So, it is important that the disinfectant is either being made by or made under supervision of trained personnel. After preparation the disinfectant should be labeled properly with name of disinfectant, percentage of concentration, preparation date and time. 2. Disinfection without trolley: The disinfection should be taken as the proper procedure. It needs hand hygiene between two patients, clean mops/ wipes, and proper follow of post procedure guidelines. 3. Lack of single stroke technique: This is one of the most common errors noticed in many Indian hospitals. Many hospital attendants or health care workers don’t understand the single stroke method. One average size mop (of the size of adult handkerchief) can be folded twice. One face of folded mop can be used for single stroke. In that way a single mop if folded twice have 8 faces (4 in outer side folds and 4 in inner side folds). So, a single mop can be used for 8 strokes. The sterile OT gauze however is small and can be folded once only, so maximum four strokes would be possible with single gauze. 4. Absence of infection control points in the protocol or poor adherence related to that: There are points related to “mop management during procedure”, which should be included in the protocol of disinfection, specifically in traditional method of “basin and mop”. The mop usually needs a reasonable contact time in the disinfectant after use. So, use of multiple mops is suggested so that by the time the turn of first used mop comes it may get comparatively more contact time in the disinfectant basin. Also the technique of handling the mop should be such that the contact of fresh used mop with already disinfected mop may be avoided as much as possible. That is the main reason for using triple basin method of disinfection, i.e., one basin with water to remove dust, and two basins with disinfectant so that the ready to use mop is always placed separate from just used mop. Also there is a need to change water and disinfectant after 60 minutes or after 3 to 4 beds, whichever is early. 5. Poor adherence to post disinfection guidelines: This is more of an issue in traditional basin and mop method of disinfection. The used mop if planned to be used again, need a proper laundry with wash under warm water and sun-dry. There should be a separate place in each unit for washing of mops and preferably sun-dry. The mop when completely dries; need to be placed at clean and dry place/ drawer. It is always a good idea to use multiple mops during disinfection to ensure proper disinfection of mops as well before getting used again. For larger areas specifically it is highly recommended. Although one can use as many clean mops as they want but for reuse purpose a number of three to five mops can be used. Lesser than that will not ensure proper disinfection of mops before getting reused, and more than five may lead confusion to the mop sequence. 1. Personnel protective equipment like plastic gown, gloves, and mask. Shoes and goggles are optional based on unit policy. 4. Four color coded or marked mops/ sterile gauzes in case of ultraclean areas (OT) along with sequence chart (e.g., Brown-1st; dark green- 2nd; Parrot greeen-3rd; and yellow-4th). 1. Place three clean basins, 4 clean color coded/marked mops, water, disinfectant, alcohol hand rub, and gloves on the trolley. 4. Put around 2 liters of water in one basin, and 2 liter disinfectant in each of other two basins and label them as side basin and middle basin. 5. According to CDC guidelines (Guideline for Disinfection and Sterilization in Healthcare Facilities, 2008) any water-disinfectant mixture needs regular changes, and preferably it should be changed after every 3-4 rooms/ beds or after every 60 minutes (whichever is early). 6. Disinfection should be done from low infected area to high infected area (a list of areas can be made and labeled from low to highest infected area in individual unit based on their practices). 7. Rinse all the four mops in water and put them in side basin. 8. Take mop 1 (Figure 1), do maximum single stroke disinfection possible with single mop. Rinse that mop1 in water, and place in middle basin. Figure 1: Place all the mops in side basin disinfectant and take mop 1 to do surface disinfection using single stroke method. 9. Take mop 2 from side basin (Figure 2), do maximum single strokes of disinfection, rinse in water, and place in middle basin. Figure 2: Rinse mop 2 in water and place in middle basin disinfectant and take mop 3 out of side basin disinfectant. 10. 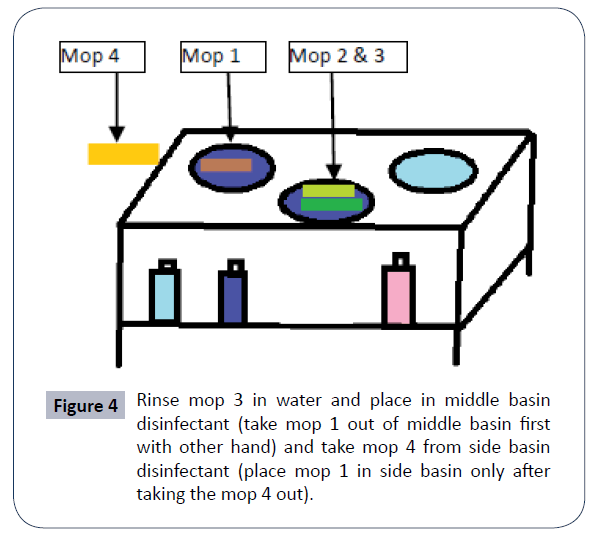 Take mop 3 from side basin (Figure 3) do maximum single strokes of disinfection and then rinse in water. Take mop 1 out from middle basin with one hand before putting used mop 3 in to that with the other hand. And take mop 4 out from side basin from one hand BEFORE putting the mop 1 in side basin with other hand. 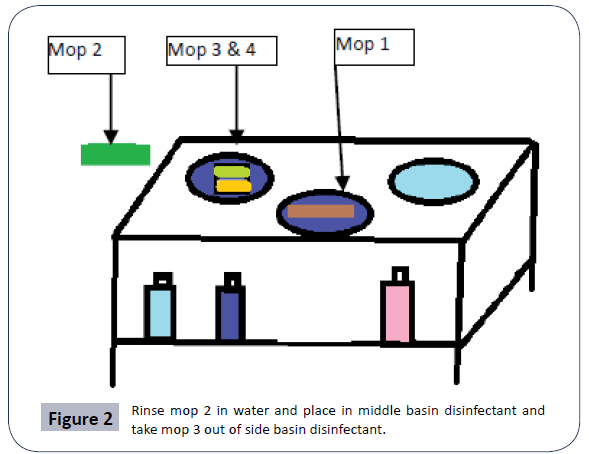 Figure 3: Rinse mop 2 in water and place in middle basin disinfectant and take mop 3 out of side basin disinfectant. 11. Use mop 4 (Figure 4) with maximum single strokes, rinse in water. Take mop 2 out from middle basin with one hand before putting used mop 4 in to that with other hand. And take mop 1 out from side basin with one hand BEFORE putting the mop 2 in to the side basin with other hand. 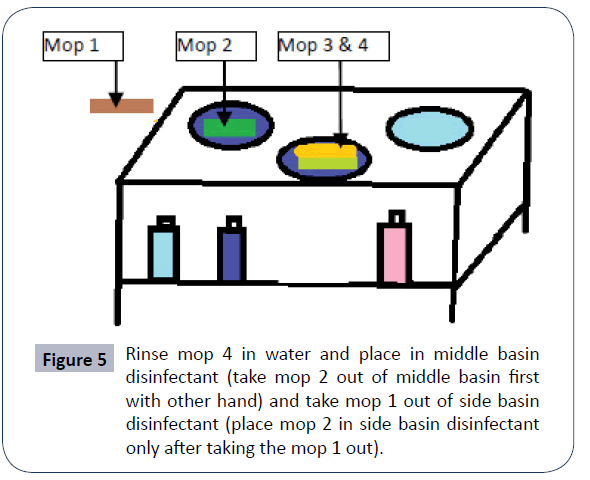 Figure 4: Rinse mop 3 in water and place in middle basin disinfectant (take mop 1 out of middle basin first with other hand) and take mop 4 from side basin disinfectant (place mop 1 in side basin only after taking the mop 4 out). 12. Use mop 1 (Figure 5) with maximum single strokes, rinse in water. Take mop 3 out from middle basin with one hand before putting used mop 1 in to that. And take mop 2 out from side basin BEFORE putting the mop 1 in to the side basin now mop 2 is ready to use. 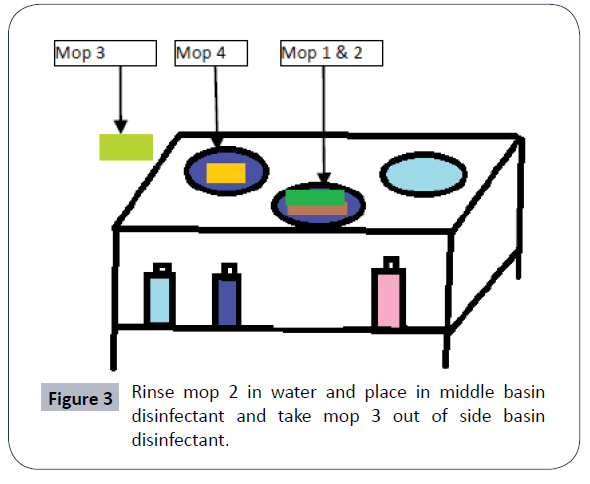 Figure 5: Rinse mop 4 in water and place in middle basin disinfectant (take mop 2 out of middle basin first with other hand) and take mop 1 out of side basin disinfectant (place mop 2 in side basin disinfectant only after taking the mop 1 out). 14. Use the same sequence till the one bed is over. 16. Water, disinfectant and gauzes should be changed after 4 beds. 17. Wash basin and mops in warm water (80⁰C), and sun-dry properly or autoclave the gauzes/ mops. Although ample amount of research can be seen on the type of disinfectants and mop to be used during hospital disinfection, very less focus has been given on the technique of hospital surface disinfection and its importance. The procedure demand attention right from the policy makers to the attendants who actually do the procedures. A common error varies with countries and hospitals. All we need is to recognize them, study the cause behind them and work on them. The step wise instructions on the technique and management of mops may help the hospital attendants who are not very educated and who actually are responsible for hospital surface disinfection in many hospitals. 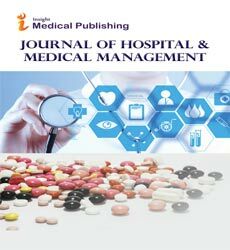 The present article is a reality oriented approach to highlight the challenges observed during the hospital surface disinfection, the reasons related to that, and its management. An infection control nurse can identify the common errors in their respective hospital related to any procedure including disinfection process and can highlight the need for review through proper channel. Doll M, Stevens M, Bearman G (2018) Environmental cleaning and disinfection of patient areas. Int J Infectious Diseases 67: 52-57. Weber DJ, Rutala WA, Miller MB, Huslage K, Sickbert-Bennett E (2010) Role of hospital surfaces in the transmission of emerging health care-associated pathogens: norovirus, Clostridium difficile, and Acinetobacter species. Am J Infect Control 38: 25-33. Rutala WA, Weber DJ (2008) Healthcare Infection Control Practices Advisory Committee (HICPAC). Guildeline for disinfection and sterilization in healthcare facilities. Ayliffe GA, Collins BJ, Lowbury EJ, Babb JR, Lilly HA (1967) Ward floors and other surfaces as reservoirs of hospital infection. J Hyg (Lond) 65: 515-36. Exner M, Vacata V, Hornei B, Dietlein E, Gebel J (2004) Household cleaning and surface disinfection: New insights and strategies. J Hosp Infect 56: S70-S75. Barker J, Vipond IB, Bloomfield SF (2004) Effects of cleaning and disinfection in reducing the spread of Norovirus contamination via environmental surfaces. J Hosp Infect 58: 42-9. Dharan S, Mourouga P, Copin P, Bessmer G, Tshcanz B (1999) Routine disinfection of patients environmental surfaces. Myth or realtiy? J Hosp Infect 42: 113–7. Westwood JC, Mitchell MA, Legace S (1971) Hospital sanitation: the massive bacterial contamination of the wet mop. Appl Microbiol 21: 693-7. Rutala WA, White MS, Gergen MF, Weber DJ (2006) Bacterial contamination of keyboards: Efficacy and functional impact of disinfectants. Infect Control Hosp Epidemiol 27: 372-377. Rollins W, Hall J, Grant C (2008) Removing bacteria from hospital surfaces: a laboratory comparison of ultramicrofibre and standard cloths. J Hospital Infection 70: 265-271. William, Rutala, Gergen, Weber (2007) Microbiologic evaluation of microfiber mops for surface disinfection. Am J Infection Control 35: 569-573. EPA Registered Hard Surface Disinfectants Comparison Chart by NH dept. of education.